It's 7 o'clock in the morning. A warm and sunny Australian morning. We are in Darwin right now and tomorrow we will leave Australia to start a new adventure in Indonesia. we go for running along the waterfront, then a cold shower at the East Point toilets and finally breakfast in the park. It's time now to empty our beloved house/car Yolo and prepare the backpack for the next trip. We enjoy the sunset for the last night and we deliver the keys of our car to Andreas, a nice German guy who wants to buy it. 4.30 am: flight to Bali, Indonesia. We immediately head towards Ubud from Denpasar airport. Here everything seems very touristy and we feel already tired of constantly negotiating. Indeed, we usually ask first local people which is the average price for a service (eg taxi), in order not to be cheated. We stay at the hostel Uma Kutuh Ubud for less than 3 euros per night per person (1 euro = about 16,000 Indonesian rupiah IDR). We have not booked anything as usual and, despite the high season, we easily find availability. The hostel is a bit outside the town, but very nice, clean and quiet. We also rent a scooter for around 3 euros a day; it is essential to move around in the nearby villages. Ubud is actually full of tourists, many of them Italians considering that we are in the middle of August. Maybe too many according to us. 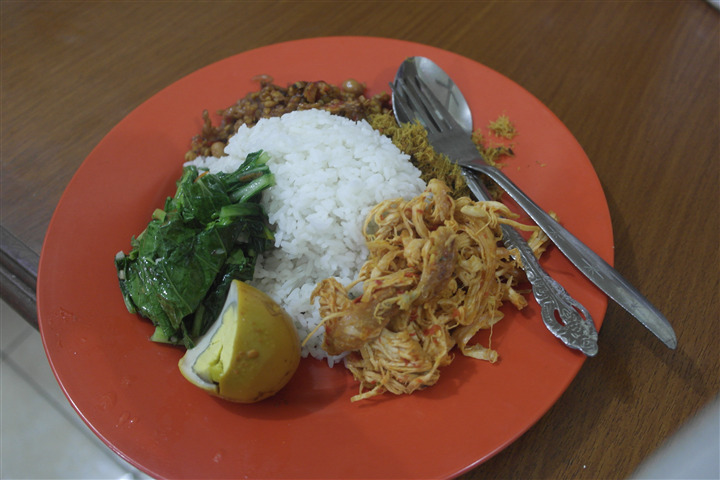 Therefore we prefer non-tourist routes and local Warung (kind of restaurants) where we can taste the local food at moderate costs (less than 2 euros per meal) and we can chat a bit 'with the locals. Indeed people here are very kind and always smiling. The first day we take a long walk through the streets of this nice village full of shops and craft markets, and we stop to visit the Monkey Forest. We pay about 3 euros per person for the entry. We strongly advise against coming here because the monkeys are treated like circus animals and dazed by too many tourists. It has been really sad! Unfortunately, we find a lot of rain these days since it is rainy river area; but we do not give up and we venture by scooter towards the Tegalalang Rice Terrace, that is a typical Balinese rice terrace field, located about half an hour from Ubud. From here we continue to the nearby Pura Tirta Empul Temple, a temple of great importance for its waters considered sacred, where people dive to purify their souls and ask the gods for money and love. The entrance costs about 1 euro and they also give us a Sarong (that is a cloth to put on as a skirt) which is mandatory to visit the temple. Despite the numerous tourists, it deserves a visit. At the exit, we meet a guy who invites us to visit his family coffee and chocolate farm. It is very interesting to see how they produce them and make us taste different types of coffee. There is even a type of delicious coffee called Kopi Luwak, produced with digested berries then defecated by a little local animal! We decide to buy some really good dark chocolate. The next day, despite the torrential rain, we go towards Mount Batur north of the island, which obviously we cannot see because of the dense rain. However, we reach the majestic Besakih Mother Temple after two and a half hours by scooter under the water. It is the most important and sacred temple of the Hindu religion in Bali and it is really beautiful. Therefore we recommend to explore the island of Bali near Ubud, avoiding the major tourist centres, and let yourself be guided by these endless green fields often inhabited by cute little monkeys. In fact, we avoided going to the south of the island (in the Kuta area) where local people told us that most tourists are concentrated thanks to the bustling nightlife. They also do not recommend staying on this island if you are looking for Caribbean beaches. Here, in fact, it is worth coming mainly for the Hindu temples and the many ceremonies provided by this religion. We end our stay in Bali with a relaxing Balinese massage. Ubud is actually full of all kinds. We choose a full-body massage of 1 hour for around 4 euros each. Really a great way to greet this island and get back on the road.